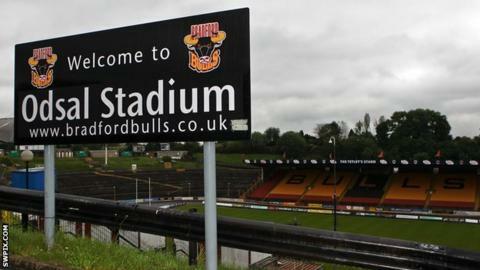 Bradford Bulls managing director Steve Ferres has apologised for their "embarrassing" 84-6 defeat at Wigan. The hosts ran in 15 tries as Bradford suffered their worst ever defeat. The Odsal side, who are appealing against a six-point deduction for entering administration, remain bottom of the table on minus two points. "On behalf of Bradford Bulls, I would like to apologise for what was a truly woeful and embarrassing display," Ferres said in a statement. "It was, without any doubt, the worst performance I have seen by a Super League side - and one of the worst I have ever seen. "The squad has hit a low point and a root and branch review of what went wrong, why it happened and where we are going is now under way. "The board of directors accept they have inherited a squad, which has been stripped of talent and hampered by injuries. "But that cannot be used as an excuse for what happened at the DW Stadium." Ferres, who was previously chief executive at Castleford, joined the Bulls when Marc Green completed his takeover in March. The Bulls have recorded just one win since then and have lost their last seven league matches. However, Ferres remains confident that Green can help the team retain their Super League status. "In our sport, I have never met anyone as committed to turning something around," he added. "Supporters can rest assured that no stone will be left unturned as Mr Green and his team address the problems currently facing the club." Bradford, who are six points off safety at the bottom of Super League, will be in Challenge Cup action on Sunday when they play Catalan Dragons at home in the fifth round.